Before 1753: he performed in Ôsaka as a wakashugata. His first stage name was Matsuyama Koshikibu II . He stopped acting and worked as a merchant for a few years. 1st lunar month of 1753: he was back in the Kabuki world, took the name of Matsuyama Sanjûrô and became tachiyaku. 11th lunar month of 1753: Sanjûrô played at the Ônishi no Shibai the role of Kiso Yoshinaka in the kaomise drama "Taihei Kiso Monogatari". Fall 1754: Sanjûrô went to Edo. 11th lunar month of 1754: Sanjûrô played at the Moritaza the role of Osada no Tarô in the kaomise drama "Kiichi Hôgen Shinan-guruma"; his stage partners were Suketakaya Takasuke I (zagashira), Sanogawa Ichimatsu I, Azuma Tôzô II, Sawamura Otoemon II, Ichikawa Masuzô I and Arashi Wakano II. 1st lunar month of 1755: Sanjûrô played in the same theater the role of Soga Jûrô Sukenari in the new year sogamono "Sono Sugata Ariake Soga"; his stage partners in the roles of Kudô Saemon Suketsune and Soga Gorô Tokimune were Suketakaya Takasuke I and Ichikawa Senzô. 1st lunar month of 1756: Sanjûrô played in the same theater the role of Sasaki Saburô [picture] in the new year drama "Keisei Kane-ni Sakura". Fall 1758: Sanjûrô went back to Kamigata. 11th lunar month of 1758: Sanjûrô played at the Kado no Shibai the role of Manono Tarô in Namiki Shôzô I's kaomise drama "Arigatashi Fujiwara Keizu", which was produced by Nakayama Bunshichi I. 12th lunar month of 1758: Sanjûrô played in the same theater the roles of Hanamitsu Nuinosuke and the servant Yokurô in Namiki Shôzô I's ni-no-kawari drama "Sanjukkoku Yobune no Hajimari". 1st lunar month of 1759: Sanjûrô's rank in the Ôsaka hyôbanki, tachiyaku section, was jô-jô-(shiro)hankichi (superior - superior - (white) half excellent). 4th lunar month of 1759: Sanjûrô played in the same theater the roles of Kanônosuke Naonobu and Zesai's mother in the drama "Gion Sairei Shinkôki". 11th lunar month of 1759: Sanjûrô played at the Naka no Shibai the role of the kagokaki Matasuke, in reality Soga no Tarô, in the kaomise drama "Mibae Soga Azuma Tanzen", which was produced by Arashi Kichisaburô I. 1st lunar month of 1760: Sanjûrô's rank in the Ôsaka hyôbanki, tachiyaku section, was jô-jô-hankichi (superior - superior - half excellent). 11th lunar month of 1760: Sanjûrô performed at the Naka no Shibai in the kaomise drama "Miura no Ôsuke Toshitoku Môde", which was produced by Anegawa Shinshirô II. 1st lunar month of 1761: Sanjûrô's rank in the Ôsaka hyôbanki, tachiyaku section, fell to jô-jô-jû (superior - superior - "ten"). Fall 1761: Sanjûrô went to Kyôto. 11th lunar month of 1761: Sanjûrô played in Kyôto at Kameya Kumenojô's theater the role of the chûnagon Korenari in Amano Kyûshichi's kaomise drama "Mineiri Futaba Genji", which was produced by Sawamura Kunitarô I. 1st lunar month of 1762: Sanjûrô's rank in the Kyôto hyôbanki, tachiyaku section, was one black stroke below jô-jô-hankichi (superior - superior - half excellent) [visual]. Sanjûrô played in the same theater the roles of Chûjô Yoshio and Togashi no Saizô [picture] in the new year ni-no-kawari drama "Keisei Kanekake no Matsu". Fall 1765: Sanjûrô went back to Ôsaka. 11th lunar month of 1765: Sanjûrô performed at the Wakadayû no Shibai  in the kaomise drama "Hanayagura Kikigaki Taiheiki", which was produced by Anegawa Kikuhachi. 11th lunar month of 1766: Sanjûrô played at the Kado no Shibai the role of Ono no Tôtarô in the kaomise drama "Mukashi Mukashi Ôsaka to iu Zaisho no Yurai", which was produced by Arashi Hinasuke I. 12th lunar month of 1766: Sanjûrô played in the same theater the role of Tsuji Hôin [picture] in the drama "Hirakana Seisuiki". 8th lunar month of 1766: Sanjûrô performed in the same theater in the drama "Ôsaka Nikki Shio no Chôjirô". No record afterwards. Matsuyama Sanjûrô was an Ôsaka tachiyaku actor, who was active from the first half of the 1750s to the second half of the 1760s. No record for his wakashugata years. He spent 4 seasons in Edo and 4 seasons in Kyôto. He most likely died in 1767. Was he a disciple of Matsuyama Koshikibu I? 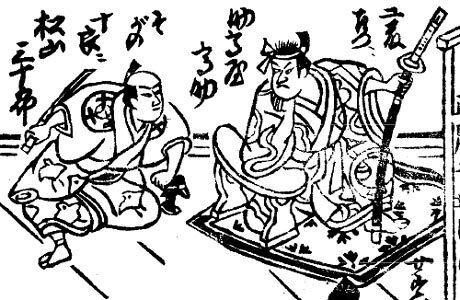 No reference to this possible master-disciple relationship in Nojima Jusaburô's book "Kabuki Jinmei Jiten". The Wakadayû no Shibai was a hama shibai venue in Ôsaka.